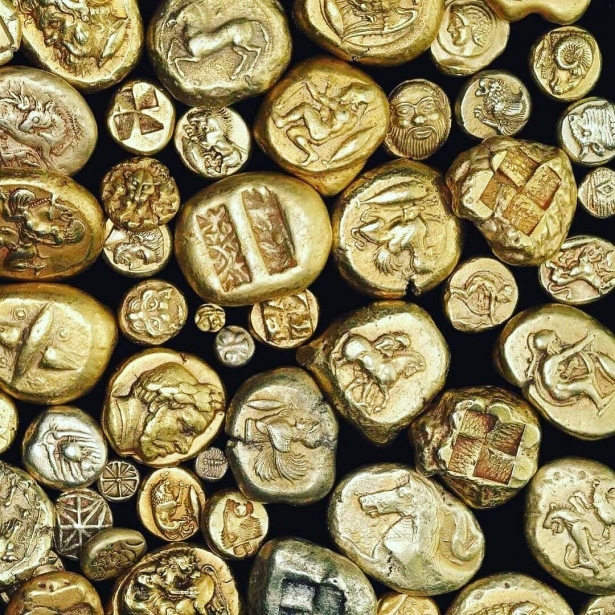 Since ancient times, gold played a major part in the lives of people of South America. 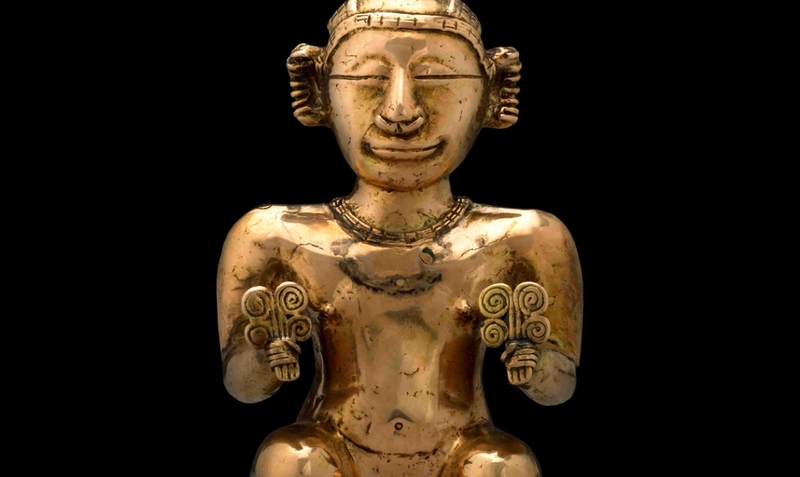 In order to create jewelry, Indian craftsmen of Colombia used the lost-wax casting technique. With its help, the ancient jewelers managed to create unusual decorations of intricate shapes. The lost-wax casting is a process of making duplicate metal sculptures and figurines using wax molds. When heated, beeswax melts down, emptying the casting mold and getting replaced with a precious alloy. This technique allowed the Indians of Colombia to create objects of exceptional beauty, decorated with complex ornaments. 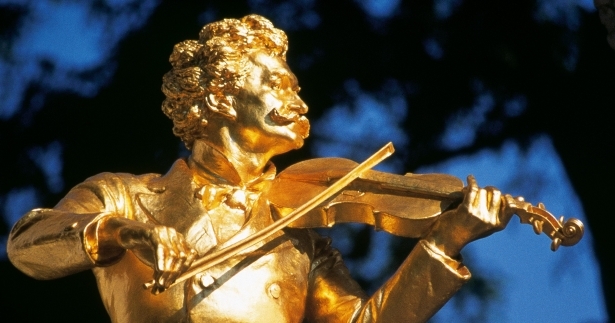 The ancient craftsmen used two methods of lost-wax casting. The first method: the product was made purely from wax without any internal clay plugs; the second method: a core of clay and charcoal were added. The first method was used to create small flat figurines of people and animals, decorative pins with volumetric pommels and jewelry. 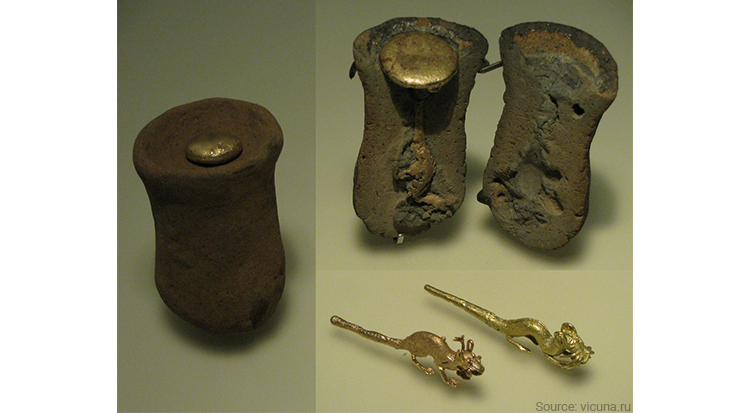 Precious items were mostly made from tumbaga – an alloy of gold and a high content of copper (70%). 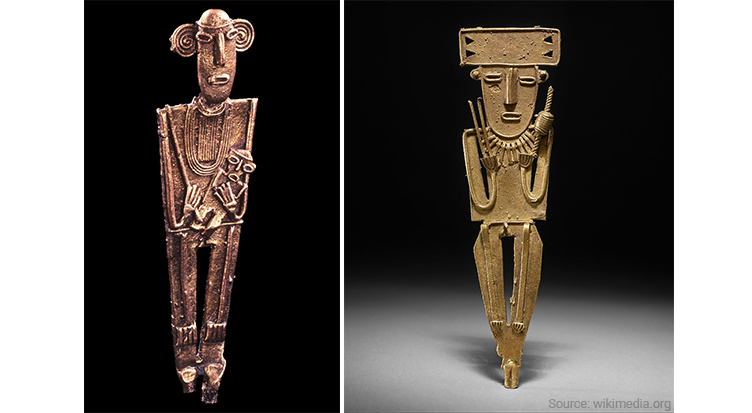 In the photo: figurines of people, made from tumbaga using the lost-wax casting method in 600–1600. Exhibits of the Museum of Gold, Bogotá. In the photo: gold pommel, made using the method of lost-wax casting in 200–1300. 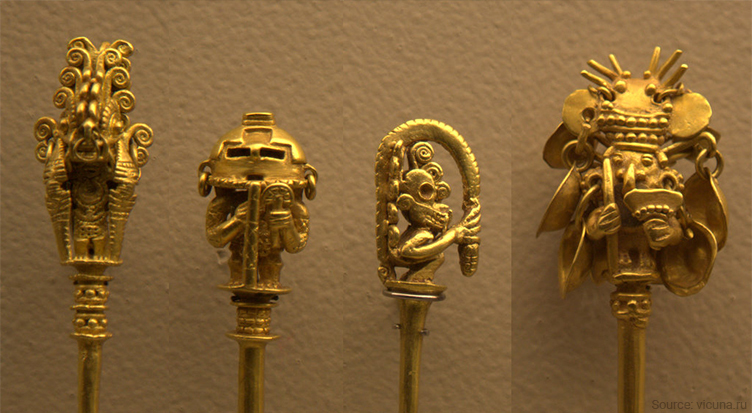 Exhibits of the Museum of Gold, Bogotá. 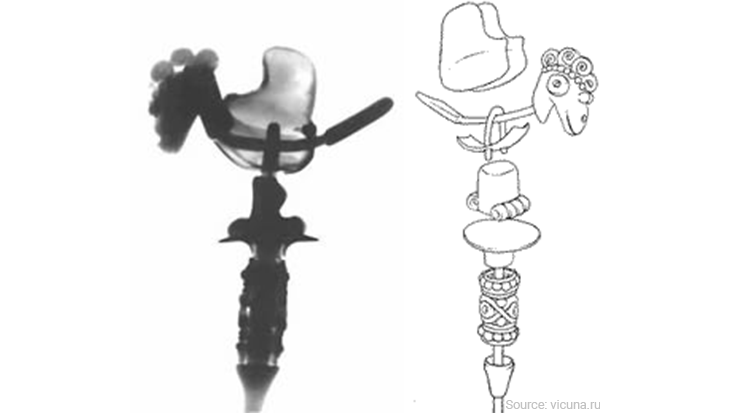 Decorative pins with movable caps, made in Valle del Cauca, western Colombia, were recognized as the most unique artifacts in the country. There is a bird at the top of the pin, consisting of several separate parts. Inside there is a moving axis, courtesy of which the bird can nod its head and move the tail. The bird's body is made of tumbaga, while both its tail and head are cast of pure gold: the soft metal enhances the object’s mobility. The prototype of the final product was made from purified beeswax. Jewelry was made of gold and placed on a wax template. The figurine was stuffed in a clay mold and subsequently heated. The wax melted down, leaving an imprint inside the mold, while the small gold details remained intact. 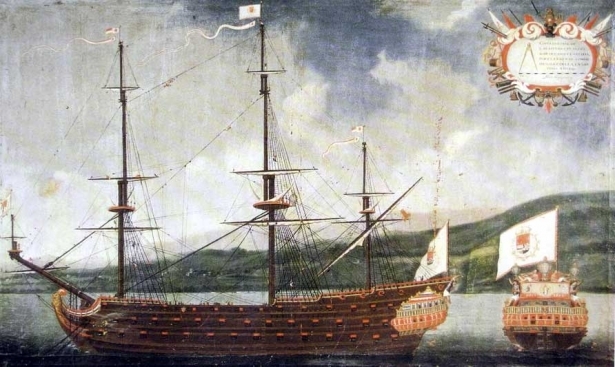 Instead of a wax spillage, a precious alloy of gold and cooper, namely tumbaga, filled the mold. In order to extract the final product, the cooled-down clay was smashed. In the photo: on the left – a solid clay mold for casting jewelry, on the right – a sectional view of the mold. Exhibits of the Museum of Gold, Bogotá. The lost-wax casting method was used if the craftsman wanted to make a three-dimensional object, for example, a hollow vessel. Charcoal and clay were used to make a desired form – a prototype of the final product. It was covered with beeswax, and then a layer of clay was applied. The clay figurine was gradually heated to melt the leftover wax, giving more space for the metal to take shape. The clay form was filled with molten alloy of gold, which took the form of a primary billet. Then, the outer clay shell was smashed, and the precious product was extracted – the exact copy of the wax form. Afterward, the gold object was polished with sand and smooth pebbles. In the photo: the liquid vessels cast from tumbaga using the lost-wax casting method with a clay core. Years: 500-700. Exhibits of the Museum of Gold, Bogotá. 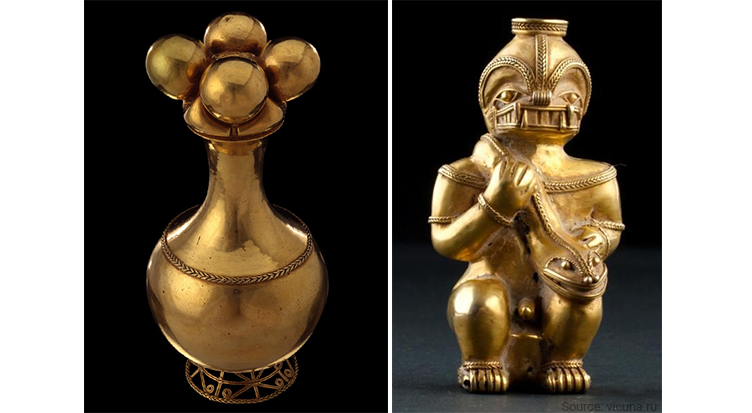 Gold products of ancient Colombia, made by casting method using a wax model, exemplify the unique craftsmanship of jewelers of those times. This method made it possible to produce precious vessels with intricate ornaments ensuring a mass production of a whole range of items.